Kiaora Bohlool has been a journalist since 1998. With chefs in her family, she has a lifelong appreciation for food; Kiaora and her husband opened their own family cafe on the mainland in 2011. 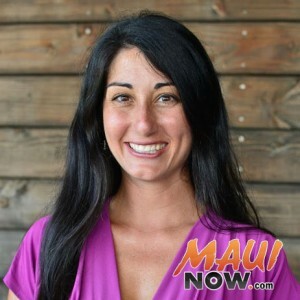 She shares the stories of Maui’s chefs, restaurants and food trucks as a sampling of the culinary scene, to educate readers on new (and old) places to eat, encourage them to support Maui businesses, and empower them to make their own decisions as diners. The Ritz-Carlton Kapalua put focus on the growth of culture and awareness at the 27th annual Celebration of the Arts, a festival that sprouted from controversy. Maui Country Club is known as a place to play for kids and adults alike. Now there's even more focus on the fun with new art and sports programs for keiki. A pastry chef from Four Seasons Resorts Maui takes to the national stage in Food Network's Spring Baking Championship, premiering on March 18, 2019. With a casual vibe, local quality food and even cocktails that turn color, Montage is now revealing the The Hideaway at Kapalua Bay. With traditionally-crafted bagels, organic ingredients and local coffee, Westside Bagel offers a full breakfast and lunch menu in Lāhainā. Four Seasons Resort Maui unites wine and food in fine fashion from March 1 to 3 in Wailea! Get a sneak preview of this first-of-its-kind event in our video. “Humpbacks of Hawai‘i Exhibit & Sphere” is now open at Maui Ocean Center in Mā‘alaea, sharing an experience literally like no other on earth. Spago Maui will celebrate Chinese New Year with a night market on Monday, Feb. 18 that features char siu pork belly, roasted duckling, grilled lobster and more. Kraken Coffee will celebrate its Feb. 9 grand opening in Kīhei's food truck with live music, giveaways, free coffee for kama‘āina and 50% off for others. With a range of local plate lunch options and live entertainment, Kīhei Bar & Grill celebrates its grand opening in Pi‘ilani Village Shopping Center on Jan. 24.